I’ve grouped these items together for the advertising and gas company memorabilia collectors! There are two unopened packages of red spiral 12” candles. 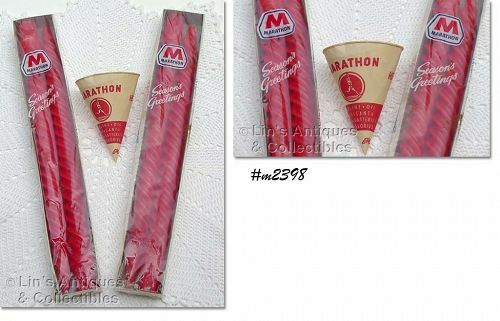 They have the Marathon trademark and “Season’s Greetings” on the front of each package and the backs show that Candle-lite Inc. produced these for Marathon. The other item is a Marathon (disposable) paper cone cup made by Lily. It has Marathon’s “running man” on front. Neat items – great gifts for that special collector!